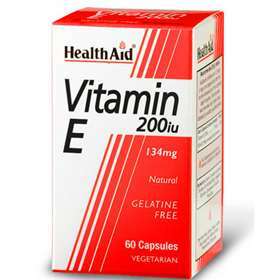 Health Aid Vitamin E is a powerful natural antioxidant that supports vital nutrients like vitamin A and unsaturated fatty acids from oxidation which can be harmful to the body. Those who wish to improve their immune system. Those who have sun damage or just want to maintain healthy skin. Protects against air pollution and toxins. protects skin from ultraviolet radiations and sunburns. Reduce symptoms of premenstrual syndrome. For adults and children over 12 years of age. Take one capsule daily after food, can be increased up to two capsules daily. Do not exceed recommended daily intake unless advised by a suitably qualified person. Each vegetarian capsule contains: Vitamin E (200iu) 134mg (recommended daily allowance:1340%). Vitamin E (D-alpha tocopherol), capsule shell (glycerol, modified starch, carrageenan, Di-sodium phosphate), soybean oil.